Newspaper is one of the most popular WordPress themes for blog, news, magazine and any other publishing websites. Newspaper comes with many pre-built demos that can be imported with one-click. It is powered by the tagDiv Composer, an intuitive front-end page builder, based on drag-and-drop functionality. Also, the theme comes bundled with the Visual Composer plugin. 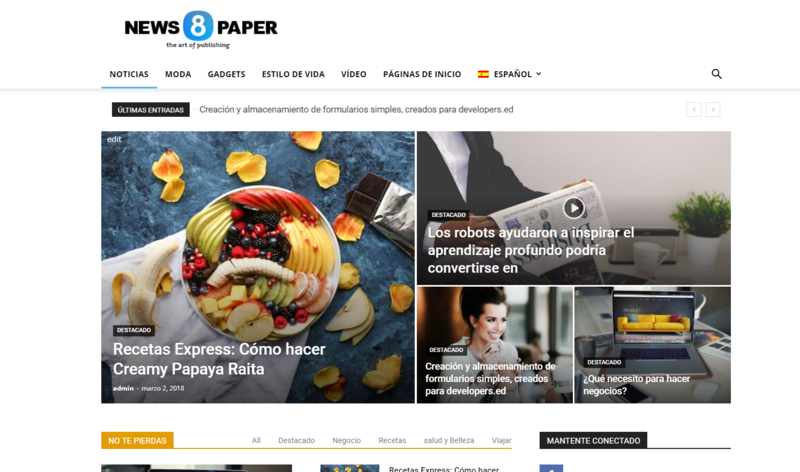 In this tutorial, you can learn how to create multilingual WordPress sites using the Newspaper theme and WPML. Make sure that the Newspaper theme is activated by going to the Appearance -> Themes page. Also make sure that the WPML Multilingual CMS, WPML String Translation, WPML Translation Management, and WPML Media Translation plugins are activated. With WPML, you can translate any type of content on your site, including pages and posts. For an easy start, read our Getting Started Guide. Note that you must translate all posts on a page in order to display those translated versions on translated pages. The process of translating pages built using the tagDiv Composer is identical to that for translating pages built using the WPBakery Page Builder. This is a simple page created using the tagDiv Composer. Closing the tagDiv Composer takes you to the default WordPress editing screen. In the Language meta-box, click on the plus icon to translate the page. This takes you to the Translation Editor page where you can edit and publish the translation. The Newspaper theme comes bundled with WPBakery Page Builder. Visit our documentation page for detailed steps on how to translate contents built with WPBakery Page Builder. With WPML, you can globally translate post categories and taxonomies. In addition, you can translate any custom taxonomy. For more details, check our tutorial on translating post categories and custom taxonomies. The Newspaper theme allows you to decide where to use the menus: on Top Bar, Main Menu, and Footer. It also lets you show a beautiful Mega Menu. Our Contractors are experienced WordPress and WPML developers who are ready to help you with everything from building complete sites to developing custom components. They are experienced at building multilingual sites using the Newspaper theme and WPML. You can look them up based on specialty, project size, website category, and the different languages that they speak. Feel free to contact a contractor directly and obtain a quotation. We have supporters in our forum who are ready six days a week to assist you. They are trained in using WPML with the Newspaper theme. If you are working with a developer on your site, please go to our Translation support forum to obtain help with translating your site’s content. If you are setting up the site and WPML yourself, feel free to obtain help in our Technical support forum.